She asked for more traditional log cabins and I started with this one. Not so traditional. Lucky she sent planty of fabric!! The most recognisable as a log cabin, I think. 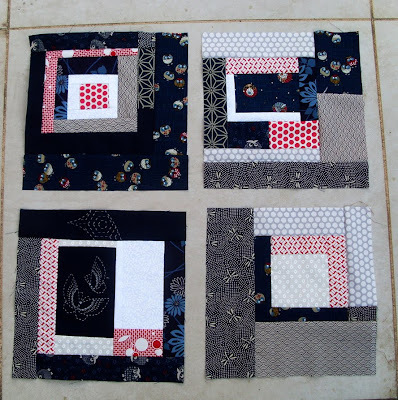 This quilting bee thing is fun but I seem to put lots of pressure on myself to really get the blocks "right". Do you guys have that experience? Have a great and crafty weekend. I likey! They are very artsy and creative. Keep going! first off, I LOVE the name of your bee - and the button! It's great! I love your blocks and am sure she will too. I've found that everyone interprets everything differently and so you get some really unique blocks because of it. And that, I think, is half the fun! Congratulations on the new bee! I really like how you blocks turned out. They are wonderful and unique which makes them even more special. We all get nervous I think with quilting bees, but it is much fun! I definitely feel that pressure too when swapping blocks! Your log-cabinish block are great though, they have a lot of added detail, which thereby adds interest and movement. Love them all! Together they look fantastic. I think they are wonderful - am sure Mel will love them! Those are some very cool blocks! I'm sure she'll love them. I've just joined my first quilting bee too and boy, I totally get what you're saying! I think there's more pressure because with regular swaps, the thing you're swapping is usually a gift, but this is going to become part of a quilt that will actually be used! So there's pressure for sure. I'm feeling extra pressure in mine right now because I'm so far behind and I feel horrible - but that's my fault, not the bee's! 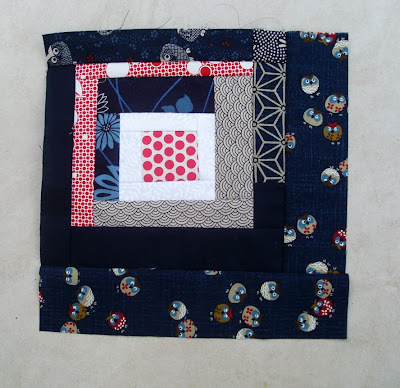 I love your blocks, and the little owls in there are so cute.... It sounds like a lot of fun to be doing these quilting bees. 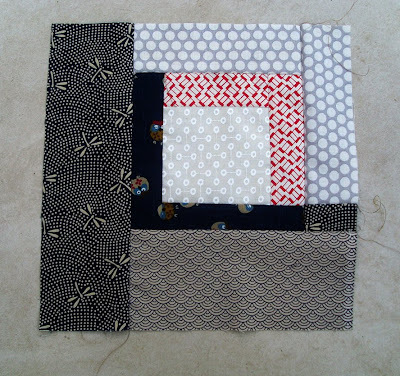 You can get a good diversity based on a block or a particular fabric. Unless you know somebody really well, it is not easy to know if they will like what you make. Sometimes it takes a bit of getting to know a new pattern before you like it too. 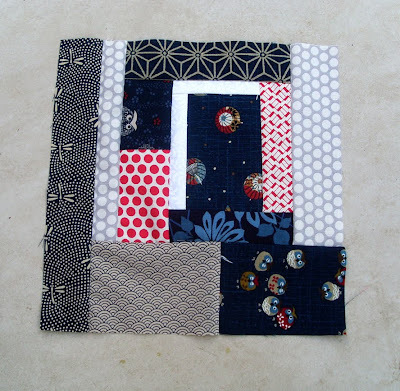 I have just joined a bee and made my first blocks for somebody. I understand the pressure you are taking about, wanting them to be happy with the result. 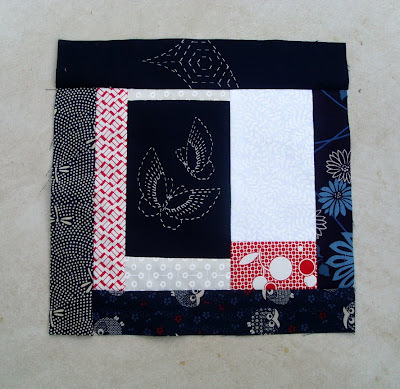 It is a great way of trying something new, without having to make a complete quilt! I love them, I think you've done great. I understand what you mean though. i'd be happy with those blocks!! nice job! I just joined my first quilting bee too and just got my fabric a couple of days ago. I haven't started on my blocks yet because I have been researching what she likes and wants! Yes it is more stressful....but fun too. and I love your blocks. Just bought some Japanese fabric. Maybe I'll use like this!